Other noteworthy productions over the years included “The Owl and the Pussycat” (1960), with Bill Bixby, who later starred in “My Favorite Martian,” “The Courtship of Eddie’s Father” and “The Hulk,” and Carol Cole, daughter of Nat King Cole and sister of Natalie; “Hamlet” (1962), starring Guy Stockwell; “The Man in the Ice Cream Suit” (1965), a comedy written by Los Angeles sci-fi writer Ray Bradbury; and “Fortune in Men’s Eyes” (1968), directed by Sal Mineo. Mineo returned to the Coronet in 1976 to play the lead in “P.S. Your Cat Is Dead,” after a successful run in San Francisco. On the night of Feb. 12, returning home after rehearsal he was knifed to death as he exited his car at his apartment on Holloway Drive at Alta Loma. The murder was determined to be a robbery a gone wrong, and a suspect was charged and convicted for his murder. 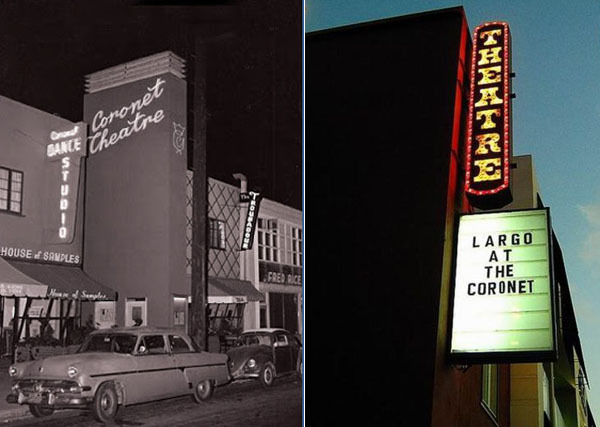 In 2008 the Coronet became the new home of Largo, a performance space formerly on Fairfax Avenue. Largo at the Coronet continues to offer plays as well as music and comedy concerts today.